Add some historic charm to your bird sanctuary using the Home Bazaar White Shelter Island Summer Cottage Bird House. The generous size, intricate detailing, and white tone throughout this unit add a crisp and striking look to your yard, perfect for housing birds or creating a focal point. Dual levels of faux windows mimic a two story home, and shutter shapes flank a few of them for added realism. Geometric forms and gingerbread trim beneath the roof line capture attention, and decorative railings on each level complete the unit. Wooden shingles adorn the intricate roof, and its pitched shape and generous overhang prevent rain from reaching the 1.25" diameter entry hole. This opening allows small songbirds to enter the shelter, which provides plenty of nesting area. Two drainage holes on the base of the home help it remain dry, and a ventilation gap beneath one side of the roof keeps the interior temperature nicely regulated. A bit of screen beneath the entrance helps fledglings reach it, while the balcony area outside the entry offers perching and landing spots. Remove the significant back panel to check the nest or perform seasonal maintenance, and display this home on a wooden post with its included, 5.75" long bracket. Made from wood, the structure will remain lovely for seasons of use, and its white color adds a bright hint. 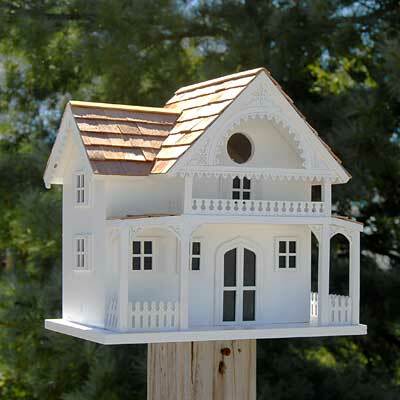 Showcase unique architecture in your garden with this White Shelter Island Summer Cottage Bird House.